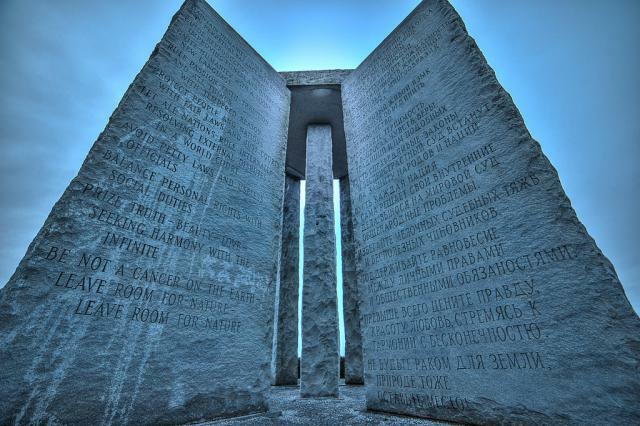 Today Will & Bruce talk about The Georgia Guidestones a granite monument erected in 1980 in Elbert County, Georgia, in the United States. A set of 10 guidelines is inscribed on the structure in eight modern languages, and a shorter message is inscribed at the top of the structure in four ancient language scripts: Babylonian, Classical Greek, Sanskrit, and Egyptian hieroglyphs. The monument stands at an approximate elevation of 750 feet above sea level in Elbert County, about 90 miles (140 km) east of Atlanta, 45 miles (72 km) from Athens, and 9 miles (14 km) north of the center of Elberton. A previous claim that the location is the highest point in Elbert County is incorrect, according to peakbagger.com. The actual Elbert County high point (elevation 840 feet) is located near the county line about ten miles away, northwest of Bowman, Georgia. One slab stands in the center, with four arranged around it. A capstone lies on top of the five slabs, which are astronomically aligned. An additional stone tablet, which is set in the ground a short distance to the west of the structure, provides some notes on the history and purpose of the Guidestones. The structure is sometimes referred to as an “American Stonehenge”. The monument is 19 feet 3 inches (5.87 m) tall, made from six granite slabs weighing 237,746 pounds (107,840 kg) in all. The designer and meaning of the Guidestones are unknown, leading to speculation and conspiracy theory.